NOTE: The Yamaha SRV250 was never sold in the United States. The engine is basically the decidedly milquetoast 250 Virago/V-star mill with peak power bumped about 25%, to 27 horsepower. Unfortunately, low-end power drops correspondingly. The bike is light and narrow, so it steers nicely, but the beginners-spec suspension is not very compliant over rough pavement and it feels unsettled on major highways. Just outstanding. The café style and exposed, round frame tubes look elegant and traditional without being so overly retro as to become gimmicky. Works perfectly with the bike's narrow frame and light weight. Especially tasty with black engine paint. The engine has been around forever and has proven reliable. The low-priced finishes don't hold up forever and chassis components may corrode over time, however. A small bike that is comfortable for full-sized adults, but limited by its meager power output. My usual 2-point deduction for non-US models. 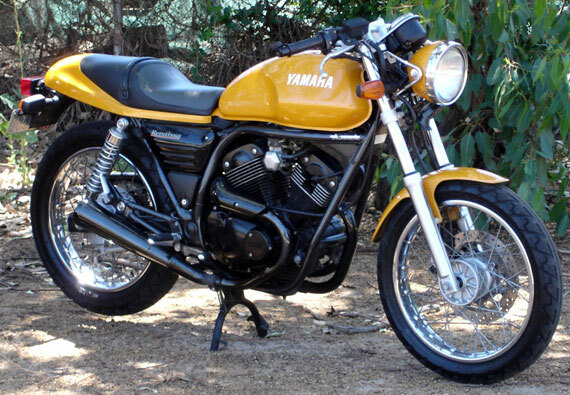 Its an attractive bike that (like most 250s) most riders will eventually tire of. Ordinary in every way but appearance. But, oh, how I do love the look.